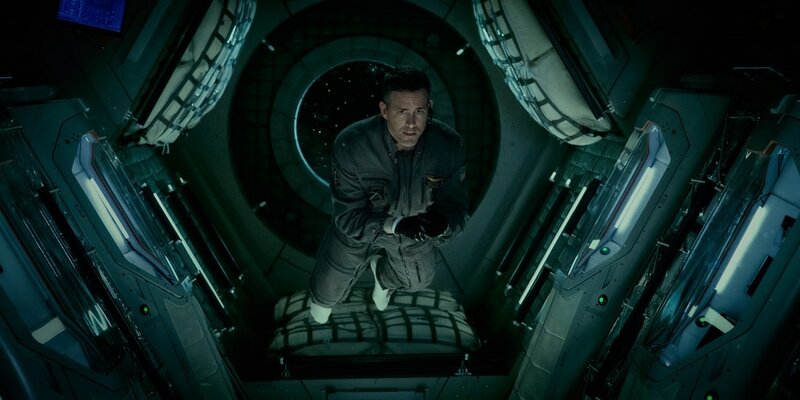 THE STORY - Astronauts (Jake Gyllenhaal, Rebecca Ferguson, Ryan Reynolds) aboard the International Space Station are on the cutting edge of one of the most important discoveries in human history: the first evidence of extraterrestrial life on Mars. As members of the crew conduct their research, the rapidly evolving life-form proves far more intelligent and terrifying than anyone could have imagined. ​Heading into director Daniel Espinosa's latest film "Life," it was not too excited as I felt based on the trailer that the film was a direct rip-off of the movie "Alien." While this is totally true and the film has very little to add to what "Alien" did, it's not a terrible movie on its own. It is in fact, a good genre exercise in horror and dread with some solid performances that manages to produce an entertaining time at the movies. The six-member crew of an International Space Station set in outer space consists of Commander Katerina Golovkina (Olga Dihovichnaya), British Biologist Hugh Derry (Ariyon Bakare), Pilot Sho Kendo (Hiroyuki Sanada), engineer Rory Adams (Ryan Reynolds) and Doctors Miranda North (Rebecca Ferguson) and David Jordan (Jake Gyllenhaal). All seems to be going well for the crew as they become the first to discover life outside of the planet Earth on Mars. They bring the small organism above their ship to study it. However, the organism nicknamed "Calvin," begins to grow in size and show hostility towards the crew as it seeks to stay alive in space by destroying anything in its path. "Life" features what will probably go down as one of the best villains of the year for me in Calvin. The terrifying organism that runs through the crew on the space station represents mankind's own destruction. It is a reminder that we are nothing but a tiny speck in a bigger universe and one day our species will be wiped away from existence. Our legacies and whatever we left behind will be gone and a new dominant force will take over. That is what Calvin represents and the results are as horrifying as they need to be. However, by the end of the film, Calvin starts to take on some more well-known "monstrous" qualities which I felt betrayed his mysterious nature in the film's second half. While I wouldn't call "Life" the best horror movie I've seen set in space since "Alien," it is a valiant effort that delivers exactly what it is that we are expecting. Unknown alien life form gets on the ship, people start dying and mayhem ensues. It's as simple of a genre picture as it gets. While the film does not attempt to go deeper with its themes, it does give us a decent amount of time with the characters before the death toll begins, so that we can care about them. Jake Gyllenhaal leads the film along with Rebecca Ferguson while everyone else including "Deadpool's" Ryan Reynolds takes more of a supporting role here. No one particular stands out nor does anyone give an Oscar caliber performance. However, the film is written well enough that nothing regarding these characters ever feels forced or dumbed down. "Life" is a serious genre film not catering towards teenagers but towards people simply looking for an entertaining film to watch over the course of 103 minutes. Which is another point I would like to make: this film is tightly paced. As Calvin grows and the body count goes up, the film's tension tightens leading to a climax where we're not exactly sure how everything will turn out and yet, Espinosa manages to subvert expectations once again in the film's final moments. "Life" does not attempt to reinvent the wheel, nor does it need to. It knows exactly what it is and never tries to pass itself off as anything else. The destruction of humanity from alien forces is usually portrayed from a global point of view in most blockbusters but here Daniel Espinosa and writers Rhett Reese and Paul Wernick put their focus and attention on the individual characters, leading to a sci-fi-horror film that has some unexpected deep levels of emotion as Calvin ravages through the members of the crew. This was better than it had any right to be. I would not call it particularly memorable but you could do a hell of a lot worse with your time.